In April, we find ourselves turning to crime - the Crime Doctor, that is! Watch a double feature of this popular 1940s film series every Thursday night this month starting at 8 pm ET. The Crime Doctor was a fictional character created by Max Marcin when he wrote and produced the original 1940-1947 radio program. The story centered around a criminal named Phil Morgan who suffered from amnesia and became criminal psychologist Dr. Ordway. As the Crime Doctor, he used his expertise to solve crimes as well as help patients. 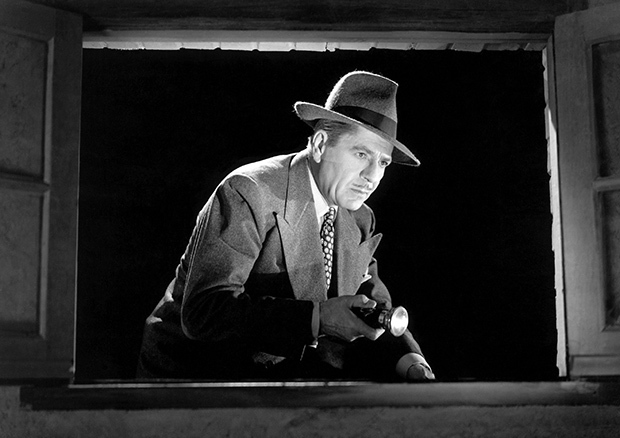 Columbia Pictures then adapted the radio series into 10 Crime Doctor films that were produced from 1943 to 1949 starring Warner Baxter as Dr. Ordway. Baxter had a great presence in early Hollywood - he won the second Oscar for Best Actor ever for his role in In Old Arizona (1929), and many know his work in the 1930s in movies like 42nd Street (1932). In the third wave of his success, he concluded his career as the popular Crime Doctor. On Thursday night we look at the first two of the film series. In the original Crime Doctor, we learn the origins of the character's story. Ten years after losing his memory from being thrown from a speeding car, an amnesia victim has recreated himself as Dr. Robert Ordway (Baxter). As a criminal psychiatrist, Ordway's extraordinary work has led to his heading the state parole board. However, he's never stopped searching for the truth about his past. When a convict who was denied parole accuses him of being a criminal, Ordway asks his friends to help him reconstruct the events that made him lose his memory. Then, during a visit to retired realtor Walter Burns, Ordway discovers that the wealthy millionaire has been poisoned. Suspicion naturally falls on ex-convict Jimmy Trotter (Lloyd Bridges), but word that Burns stashed a lot of cash at a café he owned draws attention to his brother and his nephew as well. It is The Crime Doctor's Strangest Case to solve.